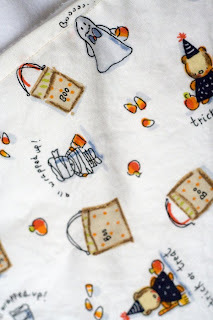 Halloween is nearly here and while my sewing skills this year are up to the challenge, my schedule is not. Luckily my oldest son decided to wear a costume from a previous year and I have his old My 1st Halloween onesie for our baby to wear. My middle child wanted to be a ghost - it sounded easy, but in his case required some real planning. At almost 4 he is incredibly accident prone and doesn't "look before he leaps", which means he acquires bruises/scrapes/bumps on a regular basis despite my constant efforts to keep him out of harm's way. Luckily he's never been seriously hurt, but after somehow tripping over his own feet & falling into the side of our coffee table & needing stitches a few weeks ago, there was no way I was going the "sheet with eye holes" route. 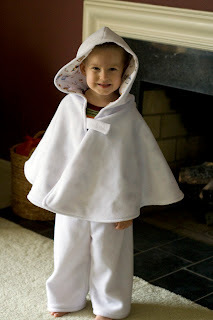 I found this tutorial for a dragon themed cape and just did a plain white version of it out of fleece and made matching pants. Now he has a ghostly shape, but his face will be unobscured and there's no way he can trip over it either. Just to make it festive, I lined it with a cute Halloween print. I LOVED that this didn't require a pattern or much time to throw together. Another plus is how the simple design can be used for loads of costume or dress-up ideas. I keep telling myself it would be silly to put time into making the baby a costume. She'll just be 2 mos by Halloween and obviously not going out, so no one would see it. It's not like I have loads of free time these days either. I did have an idea for a cute bunting style costume I could make out of stuff I have in my stash though. We're pretty sure this is our last baby, so it's kind of now or never on a newborn costume. I really am tempted to just make it anyway and post a photo here so at least some people would see it! Maybe if this weekend is low key I'll just give in and do it. Should I be practical and skip it or give in to sentimentality and just go for it?? Go for it!! Babies are so sweet all dressed up for Halloween!